Rates of suicide and undetermined death increased rapidly in Scotland in the 1980's and 1990's. The largest increases were in men, with a marked increase in rates in younger age groups. This was associated with an increase in hanging as a method of suicide. National suicide prevention work has identified young men as a priority group. Routinely collected national information suggested a decrease in suicide rates in younger men at the beginning of the 21st century. This study tested whether this was a significant change in trend, and whether it was associated with any change in hanging rates in young men. Joinpoint regression was used to estimate annual percentage changes in age-specific rates of suicide and undetermined intent death, and to identify times when the trends changed significantly. Rates of deaths by method in 15 – 29 year old males and females were also examined to assess whether there had been any significant changes in method use in this age group. There was a 42% reduction in rates in 15 – 29 year old men, from 42.5/100,000 in 2000 to 24.5/100,000 in 2004. A joinpoint analysis confirmed that this was a significant change. There was also a significant change in trend in hanging in men in this age group, with a reduction in rates after 2000. 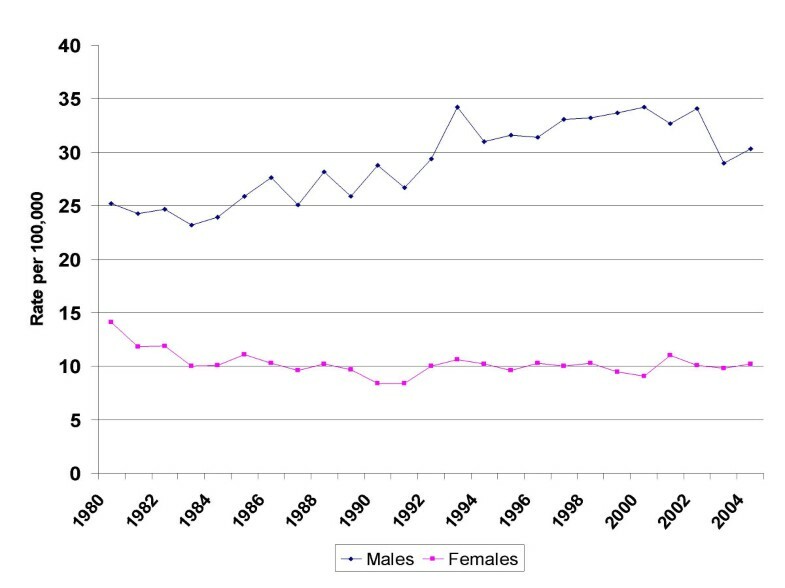 No other male age group showed a significant change in trend over the period 1980 – 2004. There was a smaller reduction in suicide rates in women in the 15 – 29 year old age group, with a reduction in hanging from 2002. There has been a reduction in suicide rates in men aged 15 – 29 years, and this is associated with a significant reduction in deaths by hanging in this age group. It is not clear whether this is related to a change in method preference, or an overall reduction in suicidal behaviour, and review of self-harm data will be required to investigate this further. Reductions in young male suicide rates have been reported in the United States  and Australia. We noted a decrease in Scottish all age male suicide rates in routinely published data in 2003 and 2004 compared to previous years. Review of age-specific rates suggested that this was related to a decrease in suicide rates in younger men. We set out to find if this change in trend was statistically significant. As the rise in male suicide rates was associated with an increase in hanging, we hypothesised that there might have been a move away from hanging as a method of suicide in younger men. The General Register Office for Scotland (GROS) provided anonymised routinely collected information on deaths by suicide and undetermined intent for 1980 – 2004 (ICD-9: E950-E959 and E980-E989 respectively; ICD 10: X60-X84 and Y10-Y34 respectively). This included age, gender and method of suicide as recorded on the death certificate. We calculated rates by age and gender using population denominators provided by the GROS. Joinpoint regression analysis (version 3) was used to assess changes in trend in the age-specific suicide rates, and in method in younger men. This method tests whether an apparent change in trend is statistically significant. Years in which trends change are termed joinpoints. The log linear option was used which allows analysis of the estimated annual percentage change in rate (EAPC). The test of annual percentage change uses an asymptotic t-test and a permutation test to determine the number of joinpoints. The constant variance option was used. Monte Carlo simulation is used to calculate p-values for a series of permutation tests. Multiple tests are performed, and the significance level is adjusted by the programme to take account of these multiple comparisons. A division in to two segments by a joinpoint reduces the number of observations in the sections, and so EAPCs for each segment may not be significant. The EAPCs are based on the asymptotic t-test, while the permutation test determines the number of joinpoints. The permutation test is a more powerful method of determining the overall trend for the segments. There was a marked reduction in 15 – 29 year old men, from 42.5/100,000 in 2000 to 24.5 in 2004, a decrease of 42%. The overall reduction in male rates (Figure 1) was a significant change in trend (Table 1), but within the age groups examined, in males only the 15 – 29 year old group had a similar significant change in trend in the same time period. The increase in EAPC in 15 – 29 year old men had slowed in 1992 – 2000, but showed a marked decrease from 2000 onwards. There were no significant changes in trend in any other male age group in the period reviewed. Suicide and undetermined deaths in Scotland 1980 – 2004. All age rates by gender. In 15 – 29 year old women a significant change in trend was found in 1996 with a considerably smaller EAPC than the same male age group. The oldest female age group showed a steady reduction over the time period, while the two intermediate groups had a small positive EAPC from the late 1980's/early 1990's. In view of the rapid decrease in young male rates in younger men, the methods of suicide in this age group were examined in more detail to test the hypothesis that the decrease in male death rates in this age group may have been associated with a decrease in the use of hanging as a method of suicide. Methods in 15 – 29 year old men are shown in Figure 2. Table 2 displays the results of a joinpoint analysis of method trend in this age group. 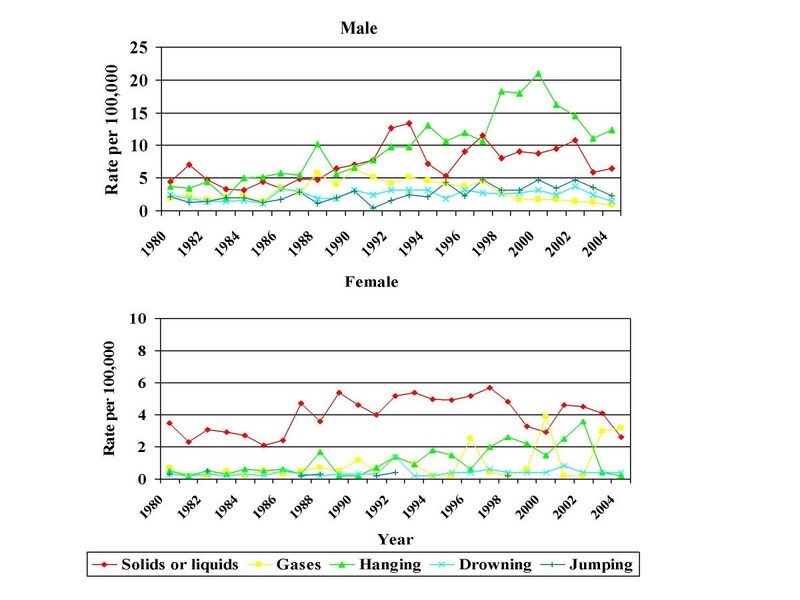 Only poisoning, hanging and use of gases showed any change in trend over the time period. 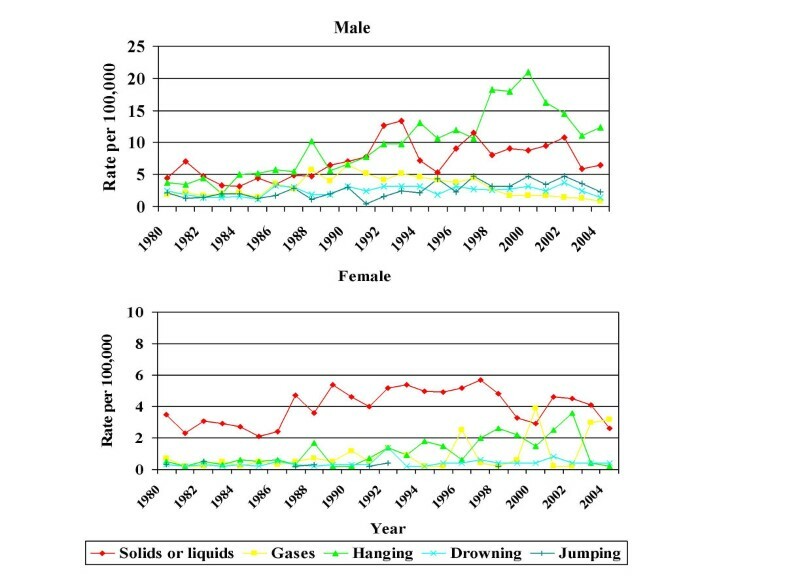 The change in trend in hanging was at 2000, while the changes in trend in poisoning and gases occurred earlier in the 1990s. Suicide and undetermined deaths in Scotland 1980 – 2004. Methods in 15 – 29 year old age group by gender. Joinpoints were also calculated for this age group in women. It was not possible to calculate joinpoints for all methods, as the dependent variable cannot be zero in a joinpoint analysis. Poisoning in 15 – 29 year old women had one joinpoint in 1994 (1980 – 1994, EAPC +5.8, 95% CI +2.5 – +9.2, 1994 – 2004, EAPC -4.8, 95% CI -9.7 – +0.4). Hanging had one joinpoint in 2002 (1980 – 2002, EAPC +10.4, 95% CI +5.9 – +15.2, 2002 – 2004 EAPC -74, 95% CI-95.6 – +49.2). The decrease in male rates was attributable to a decrease in rates in 15 – 29 year old men. Further review identified that this was caused by a decrease in hanging deaths, supporting the hypothesis that there had been a method change in younger men. There was evidence of a more modest reduction in overall rates in 15 – 29 year old women which pre-dated the male decrease. There had, however, been a recent decrease in hanging deaths in young women, although this was based on a far lower number of deaths. Most deaths by hanging in an study in England were in community settings, and therefore not amenable to restriction of method. The final number of deaths by suicide in an area is a product of the frequency of attempted suicide, and the case-fatality rate of the method chosen. A method such as self-poisoning has a lower case-fatality rate than methods such as hanging and use of firearms. As hanging is a method of self-harm with a high case-fatality rate, a change in death rates could occur by an alteration in rates of hanging alone. Changes in method preference have been suggested as a possible cause for the increase in male suicide rates in Scotland in the 1990's. If younger age groups move away from hanging as a method of self-harm, then a reduction in death rates could occur with no underlying change in the frequency of self-harming behaviour. The lack of any increase in deaths from other methods in young men suggests a true decrease in suicidal behaviour, but careful review of non-fatal self-harm statistics in Scotland will be required to test the hypothesis that there has been a decrease in self-harm in this age group, rather than a change in method preference. There is no apparent reason why there should have been a differential effect on rates of death by hanging, and this requires further exploration. Several English speaking countries have reported decreases in suicide in younger men, including America  and Australia. In the United States, suicides involving firearms decreased in adolescents, although there was an increase in hanging deaths in white males. In Australia, Morrell et al report a large decline in hanging deaths which largely accounted for the observed decrease in suicide rates in 20 – 24 year old men. The authors relate the reduction to the Australian National Youth Suicide Prevention Strategy, a programme involving primary prevention programmes, capacity building in services and treatment support. It is not possible to link these initiatives confidently to the reduction in suicide in young people. There has been, however, considerable media attention on mental health and suicide in Scotland, and the introduction of the Breathing Space helpline, the Choose Life programme, anti-stigma work and a large investment in media publicity may have contributed to the reductions seen in 2002 and subsequent years. The Choose Life project team have introduced media guidelines on the coverage of suicide, which include advice against the reporting of suicide method. The beginning of the reduction in young men seems to predate the likely impact of these national initiatives, but further exploration of the impact of these policies is essential. There was no significant change in trends in older men, or any recent change in trends in women. Much of the media publicity on suicide in Scotland has focused on suicide among younger men (Nicola Hughes, Choose Life Communications Manager. Personal Communication, 2006). It may be that work including help-lines, encouraging help-seeking behaviour and challenging stigma was interpreted by older men as referring to a younger age group, and women may not see it as relating to them at all. Views of mental ill-health, stress and help-seeking may be more ingrained in older men, leading to delays in the impact of initiatives which seek to address them. It is notable however, that this is the group of men who had shown large increases in suicide rates in previous decades, raising the possibility of a cohort effect. Cohort effects are where a particular group of people, in this case a birth cohort, carry a risk with them through the life cycle. Disentangling age, period and cohort effects in male suicide in Scotland may offer helpful insights into the factors contributing to suicidal behaviour among older men, although the speed of the decrease in younger men suggests that a cohort effect is less likely to be a possible explanation in this age group. Suicide among young men in Scotland has decreased, and this is associated with a reduction in hanging deaths. Although deaths from gases and from poisoning have also decreased in this age group of men, the temporal association with the overall reduction in male deaths is with the reduction in hanging. It is not possible to tell from suicide data alone if this is related to a decrease in suicidal attempts, or to a shift to a method with a lower case fatality rate. The lack of any increase in trends in other methods of suicide in this age group suggests that this may be a true decrease in suicidal behaviour, but this will require further investigation using information on hospital treated self-harm. It is tempting to associate the reduced suicide rate in younger men, and to an extent in younger women, with population level initiatives to encourage help-seeking, reduce stigma, increase social support and target suicidal behaviour. Further review of the impact of the national strategies will be required before any definite link can be drawn. The lack of any change in trend in older men and in women suggests that review of these national efforts would be appropriate in relation to these groups. We are grateful to colleagues at the General Register Office for Scotland for their assistance with providing the data used in this paper. NHS Highland and ISD Scotland provided staff time for this work. CS contributed to the study design, data analysis and writing of the paper. DS contributed to the data analysis and the writing of the paper. RH contributed to the study design and the writing of the paper. All authors read and approved the final manuscript.